Hibs surrendered the lead for the third time in four games as they crashed out of the Irn-Bru Cup, beaten at home by the Championship's basement club. Alex Harris had fired the Capital outfit into the lead, one which they held for only four minutes before Steven Mallan equalised for Saints who won the tie in controversial circumstances. Nine minutes from time David Clarkson's deflected shot rolled goalwards with team-mate Lawrence Shankland in a clear offside position. But he made no attempt to play the ball and although assistant referee Brian Templeton raised the offside flag, referee Willie Collum correctly awarded the goal much to the anger of the home side. A dire first half was finally brought to life as Fraser Fyvie fed the ball out to Harris on his left, the winger taking advantage of a slip from Saints Kyle Hutton to cut inside and unleash a low shot which found its way between goalkeeper Jamie Langfield and his near post, aided by a slight deflection. 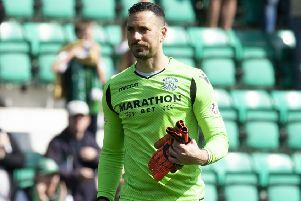 But Hibs lead lasted just four minutes, referee Collum adjudging Dylan McGeouch had impeded Rocco Quinn leaving, Buddies midfielder Mallan to step up to send a superb curling shot from the resulting free-kick beyond Hibs goalkeeper Ofir Marciano. It was a decision which enraged the home players, McGeouch seeming to have done nothing more than stand his ground as Quinn ran into him. James Keatings had a glorious chance to put Hibs ahead again five minutes into the second half, all alone at the back post as David Gray's low cross from the opposite flank eluded everyone in front of him. But the striker was left shaking his head in disbelief as he could only sky his shot, admittedly from an angle, high over the bar. McGeouch went even closer on the hour mark, hammering in a tremendous right foot shot which beat Langfield all ends up only to crash back off the goalkeeper's right hand post before Harris' pace got him onto Fyvie's ball over the top, the youngster watching closely as it dropped over his shoulder before taking it first time. But Langfield got down superbly to get his left hand onto the ball. Saints went ahead in controversial style nine minutes from time, substitute Clarkson's shot taking a deflection goalwards where team-mate Lawrence Shankland was standing in an offside position. Assistant referee Brian Templeton immediately raised his flag but, as the ball rolled into the net it was clear Shankland had made no move towards it and so wasn't interfering. Collum rightly over-ruled his assistant much to the anger of Hibs boss Neil Lennon who confronted Templeton on the halfway line. Hibs: Marciano, Gray, McGregor, Forster, Hanlon, Fyvie, McGeouch, Shinnie (Bartley 69), Harris (Holt 84), Boyle (Cummings 69), Keatings. Substitutes not used: Laidlaw, Stevenson, Eardley, Graham. St Mirren: Langfield, Naismith, MacKenzie, Baird, Irvine, Walsh (Gallagher 74), Quinn (Clarkson 63), Hutton, Morgan, Mallan, Sutton (Shankland 81). Substitutes not used: Willison, Whyte, O'Keefe, McDonald.